Home / Licensing / I have an Indian driving license and want to apply for an International driving License for my trip to Sri Lanka. How does this work, and is my Indian license valid in Sri Lanka? For anybody who wants to experience Sri Lanka from a vehicle (whether that is in a car, scooter or tuktuk), it is important to know that your Indian driving license is not valid in Sri Lanka. In Sri Lanka, an international driving license is required for anybody who is not Sri Lankan and wants to rent a tuktuk, scooter or car. 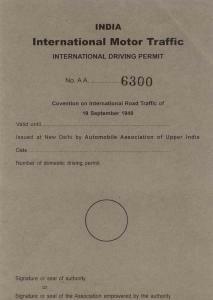 This international driving license is also known as an International Drivers Permit or IDP. With this IDP, you can easily arrange your own Sri Lankan Temporary Driving Permit. We’ve broken down for you exactly how to get your IDP! Make sure you have the following documentation ready-to-go: Form 4 or ‘Form for the Issue of International Driving Permit’ (download here), a copy of your license, a copy of your passport, 5 passport photos, proof of address, proof of age. Take your Indian driving license and your ID. The costs involved are -at the moment of writing- around Rs. 1000. Within about 5 working days, your IDP will be ready! Example of an Indian IDP. Please note that you can only apply for your personal international permit; so you cannot get it online/on somebody else’s behalf. For more information on and the details of arranging your International Drivers Permit in India, visit this website. To help you navigate the Sri Lankan system and its institutes, check this useful article!